Cadence is defined as the beat, time, or measure of rhythmical motion or activity. It is most commonly used in reference to music or sound, but it can measure activity as well. Running, for example, relies heavily on cadence—if monitored correctly, it can be used to improve running efficiency, reduce the risk of injury, lessen muscle damage in training, and enhance recovery. Running cadence is often defined as the total number of steps you take per minute, and it differs between individuals. Training history, running ability, and anatomy (height, weight, age, etc.) are all factors that can determine a runner’s cadence. For example, it can be assumed that, at a given pace, taller runners will naturally have slightly lower cadences than average due to increased stride length. Pace is important because it can also affect cadence. Generally, the faster you run, the higher your cadence is. All runners have an optimal cadence which allows for the body to do the least amount of work possible. Typical cadences fall between 160-180 steps per minute. The purpose of this investigation is to find out the relationship, if any, between the height of an individual and their running cadence. I believe that as height increases, running cadence will decrease. This will happen because height relates directly to leg length, which typically determines the stride of an individual. Generally, the longer your legs are, the longer your stride is, and a long stride implies a lower running cadence because you cover more distance with each step (your foot hits the ground less because it is in the air longer). To set up my experiment, I began by carefully selecting 20 experienced distance runners from the winter running program at Tualatin High School. Since height is not the only variable that determines a runner’s cadence, I made sure to choose 20 students with similar training histories and running abilities. This was a crucial step in setting up my experiment, for I had to control all other variables so that only height was being manipulated. I began the experiment by measuring the height of each student with a meter stick. The group consisted of 9 males and 11 females whose heights ranged from 5’1’’ (154.5 cm) to 6’5” (195.6 cm), providing a wide spread for optimal test results. To gather my data, I had each student run on a treadmill for exactly 60 seconds at a pace of 8:00 min/mile. While running, they counted the number of times their left foot hit the ground and reported that number back to me to record. I then repeated this process twice more with each runner for a total of three trials. After recording all three trials for each of the 20 runners, I averaged the trials and and multiplied each average by 2 to account for the number of times the runner’s right foot hit the ground, giving me 20 unique cadences. On the left is a picture of one of the runners during the experiment. 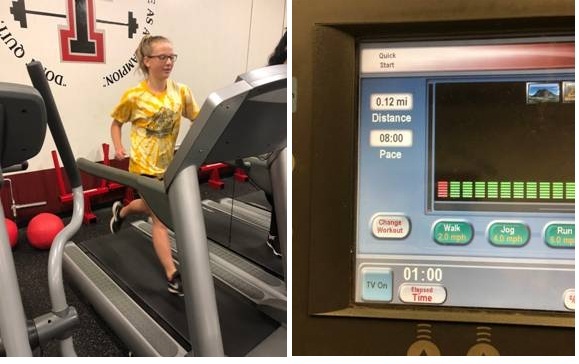 Students took turns using the 6 available treadmills at TuHS. Each treadmill was set to 8:00 minute pace at 0% incline while the runners calculated their cadence. Above is a diagram that illustrates the reasoning behind my hypothesis—as height increases, stride length increases; therefore, running cadence decreases. To test the effect of height on running cadence I had to design an experiment in which only the height of the runner was being manipulated in order to get the most accurate results. This meant that I had to find a way to control or minimize variables like training history, running ability, weight, age, and pace so that only the effect of height was present. This is why I specifically chose a group of experienced runners that were close in age and athletic ability. It is also why I had each student run on a treadmill at a given pace. By controlling these variables, I was able to eliminate their effect on the overall experiment. As for the experiment itself, I chose 20 students because I needed lots of data points in order to determine the correlation, if any, between height and running cadence. I needed a broad range of heights to support my hypothesis, so an equal number of male and female students was critical. Lastly, I chose to have each student count only the number of times their left foot hit the ground and then multiplied that number by 2, rather than having them count every single step because it is easier and leaves less room for error. In experiments like these, there will always be some extent of uncertainty due to human error. For example, the experimental uncertainty for measuring the height of each runner (in centimeters) was plus or minus .05 cm. I calculated this uncertainty by taking the smallest scale on the meter stick (.1 cm) and dividing it by 2. I also had to calculate the experimental uncertainty for all 20 cadences. For each runner, I found the range of trials 1, 2 and 3 and divided the difference by 2. 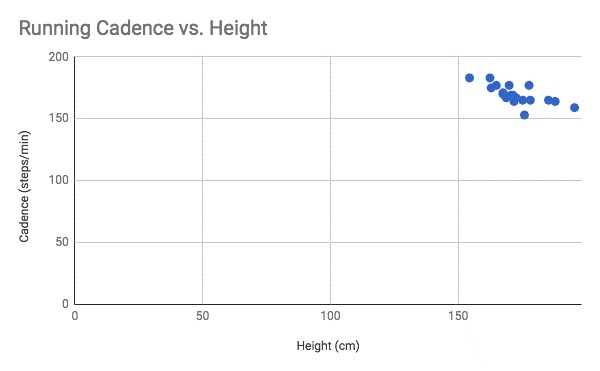 After analyzing my data, I concluded that there is a distinct pattern between height and running cadence. As seen in the graphs above, the data has a negative correlation, meaning that as one variable increases (in this case, height), the other decreases (cadence). This therefore supports my hypothesis, in which I predicted that cadence would decrease as height increased. Although my hypothesis was technically correct, the correlation of the data, especially in regard to the male results, was a bit weaker than I had expected. This was likely caused by flaws in my experimental design as well as human error. One potential flaw in my experimental design was the group of students themselves. Since there are only so many experienced distance runners at TuHS, my options were fairly limited. While the selected students were very similar in the grand scheme of things, running experience, athleticism, and anatomy did vary. All of these things can have an effect on running cadence, which may have skewed the results. Another potential flaw in my design was that I did not account for the students (if any) who had adjusted their cadence in the past in order to run more efficiently. Although cadences typically range from 160 to 180 steps per minute, 170 steps per minute or higher is ideal. As a result, some runners purposely and permanently modify their stride to reach a desired cadence, taking away from the natural correlation of height and stride length. If I were to do this experiment again, I would perform the same test on a group of nonathletic students, in addition to the group of students I used for this experiment. This way, I could compare the cadences in both groups, and the results would tell me the extent to which athleticism and running experience affect cadence. In addition to the flaws of my experimental design, it is likely that there was also some degree of human error during the experiment. One potential source of error could have been from miscounting. Since the runners were counting manually, it is probable that a portion of them got distracted and lost count. Instead of starting the process over, they most likely guessed where they left off and started again from there. This could explain why a few of the cadence uncertainties were so high. This notable flaw could be resolved in two ways if the experiment were to be repeated. The first would be to include more variations and more importantly, more trials (i.e. rather than testing 20 students, test 40 to 60 and up the trials from 3 to 5). The second way to eliminate this source of error would be to use a device that monitors cadence rather than having the runners count themselves. There are plenty of tech tools today that can track stride frequency throughout a run. The Garmin Forerunner 620, for example, provides three stride elements—cadence, vertical oscillation and ground-contact time. 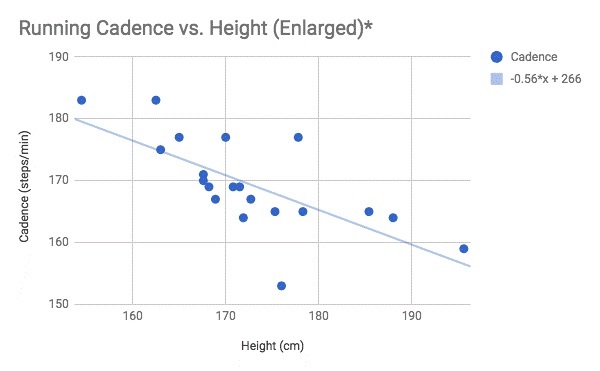 If I were to further research the effect of height on running cadence, I would begin by applying these easy solutions to my methodology in order to improve the overall accuracy of my data, and therefore the experiment as a whole. Doyle, Alana. “What Is My Running Cadence And Should I Care?” Runner's World, Rodale Inc. , 25 Aug. 2016.